How do you integrate online and blended tools in your teaching so it is possible to observe the students’ learning outcomes? This article will show you how. In this article we offer a review of how some of the various e-learning tools can help you assess the level of your students’ learning. Based on SOLO (structure of observed learning outcomes) taxonomy, we also give a brief example of using certain tools in the different evaluation phases. The learning situation involves activities such as reading, taking notes and taking part in discussions. Teaching involves grading, making decisions, solving problems, and so forth. The teacher should evaluate the students during and after the learning situations to identify what they have learned and how well they have learned it. It is therefore not our intention to look only at the evaluation after completed lessons, but also during the learning situation. This evaluation is both summative and formative (see Evaluating the Quality of Learning: the SOLO Taxonomy, Biggs, John B. & Collis, Kevin F.). Summative: This form of evaluation is a final statement about the student’s learning outcome. It is also known as the final grading. Usually this evaluation takes place in the end of a course. Formative: This form of evaluation is an ongoing process. It is not the end of a process but a new beginning. It is a way to continuously regulate the student’s current learning situation. 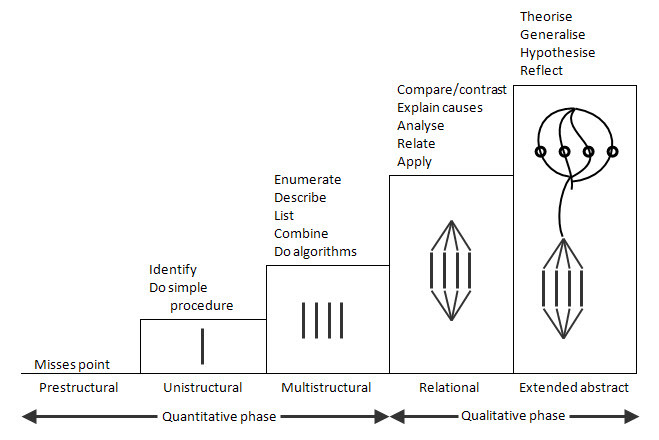 SOLO stands for Structure of the Observed Learning Outcome, and is divided in five phases. These phases illustrate different levels of comprehension. Each step presupposes the previous one, and adds something new. The point is that the students have to go through the different phases to expand their knowledge and bring it to a higher level of reflection. The teacher should ensure student progression. The teacher’s benchmarks are the learning goals described in the phases. Below we will go through these phases and describe the specific tools and methods that can be used. The quantitative phase is the first overall phase, and covers the prestructural, unistructural and the multistructural phases. Here the teacher wants to know how much the students have learned. The second overall phase is the qualitative phase, which covers the relational and extended abstract phases; here the teacher wants to know how well the students have learned the material (Evaluating the Quality of Learning: the SOLO Taxonomy, Biggs, John B. & Collis, Kevin F.). When starting a new course where you don’t know the students,it doesn’t make sense to evaluate what the students have learned, and you may not know the level of their prior knowledge in the subject. You can get an impression of the students’ preconceptions by giving them an online quiz before the first class. It will also help the students to formulate their own pre-existing ideas about the subject. When you get the results, you may find that some of the students are in the prestructural phase, and don’t know anything about the subject. Others may have learned something about the subject before and are able to identify and do a simple procedure. They are in the unistructural phase. You can then set up some learning situations that will help the students progress. 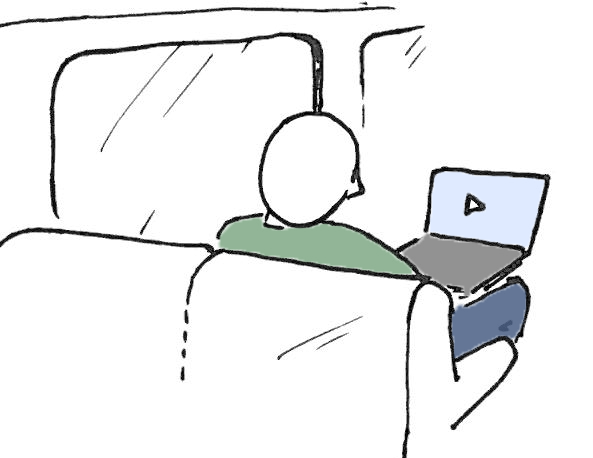 Besides your lectures, you can do several things: you can make videos available, you can underline important places in a text with a pencast, and you can make a screencast showing how to use an important tool. In addition, you can create an online discussion forum where the students can help each other learn. To see how much and how well they have learned, you can make a formative evaluation by using a student response system in your lecture. You can design questions to see if the student is in the multistructural phase, where they can describe and combine, or if they have learned the material so well that they are in the relational phase, where they can explain, use, analyse and discuss the different topics with their fellow students. The students will have to exchange their knowledge and hopefully challenge one another, which will lead to the next phase. To evaluate whether the students’ understanding reaches into other topics and whether they are able to create their own knowledge (i.e. are in the extended abstract phase), you can make a summative evaluation through an exam, a student-response system or an expanded online test.